They found a protein "signature" only present in people with the disease. Pancreatic cancer is often very advanced by the time it is diagnosed - and only 3% of patients are alive five years after diagnosis. 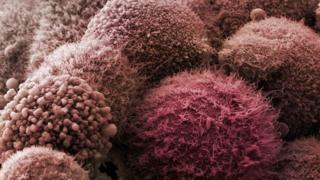 Cancer charities welcomed the study, published in Clinical Cancer Research, saying a test was "much needed". Just under 9,000 people are diagnosed with pancreatic cancer in the UK every year. It has the lowest five-year survival rate of any common cancer and one that has barely improved in 40 years. More than 80% of people with the disease are diagnosed when it has already spread, so they are not eligible for surgery to remove the tumour - currently the only potential cure. Those at higher risk include people with a family history of the cancer, heavy smokers, obese people and people over 50 who are newly diagnosed with diabetes. The scientists from the UK and Spain who developed the test hope that if its early promise is realised then it could be possible to diagnose patients much earlier and offer them treatment. The research looked at almost 500 urine samples. Just under 200 were from patients with pancreatic cancer, 92 from patients with chronic pancreatitis and 87 from healthy volunteers. The rest of the samples were from patients with benign and cancerous liver and gall bladder conditions. Out of 1,500 proteins found in the urine samples, three - LYVE1, REG1A and TFF1 - were seen to be at much higher levels in the pancreatic cancer patients, providing a "protein signature" that could identify the most common form of the disease. The signature was found to be 90% accurate. Patients with chronic pancreatitis were found to have lower levels of the same three proteins. More research is now planned, and scientists will focus particularly on people whose genes put them at particular risk of pancreatic cancer. Co-author Prof Nick Lemoine of the Barts Cancer Institute, said: "It's really exciting because for the first time we might be able to bring forward the window of opportunity for patients with pancreatic cancer - from something that is advanced and late stage to something that is early stage and potentially curable by surgery. "Patients are usually diagnosed when the cancer is already at a terminal stage, but if diagnosed at stage 2, the survival rate is 20%, and at stage 1, the survival rate for patients with very small tumours can increase up to 60%." The Pancreatic Cancer Research Fund said this was "an exciting finding" and that an early diagnostic test was "much needed". Fiona Osgun, of Cancer Research UK, said: "At the moment, we're a long way from knowing if this research could lead to a test that would help detect pancreatic cancer at an early stage, or who that test might benefit. "But research like this is vital as there's been little progress in improving survival for pancreatic cancer, and innovative approaches are needed."